I love tofu. Mapo tofu was one of my favorite Chinese-Korean dishes my mom made growing up. When I was little, I would ask for "red tofu" since my mom would make it super red and fiery. I'd eat spoonfuls of it over rice, and marvel at how good it was even though it was so red I was a little scared to eat it. There are a lot of instant versions out there now, and they're actually not bad. Nothing beats making it from scratch though, so I decided to make my own version, adapted from a recipe from a Korean TV show. About 20 minutes before you start cooking, season the meat by adding ginger, sesame oil, 1 tablespoon oyster sauce, and 1 tablespoon sake. Mix together and set aside. Heat oil in a wok or a deep pan. When the oil is shimmering, add the green onion. You want to cook the green onion in the oil as if you're frying the green onion. After a couple of minutes, add the gochugaru, and cook for another couple of minutes. You will smell the aroma of chili as it is cooked in the oil, and it will be very fragrant. This process releases the oil from the chili flakes and flavors the oil. When the pork is starting to brown, add 1/2 cup of sake. Cook until pork is no longer pink and some of the alcohol has cooked down. Add toban djan, jalapeno peppers, garlic, 1 tablespoon of oyster sauce, and sugar. Cook until the flavors are melded and add a sprinkle of salt and pepper, if necessary (I just add a pinch). Add some cornstarch water to thicken the sauce to your desire. I don't add too much since I like it with some liquid, but it's up to you how thick you want this dish. In the meantime, heat the tofu. You can warm it up in some boiling water for a few minutes, or what I do is microwave for about a minute. This way the tofu is nice and hot when you add it, and you do not have to cook the tofu in the dish. The dish is done once you add the tofu and sprinkle some extra green onion. I use extra soft tofu, but it's completely up to you what kind of tofu you like to use. Extra soft tofu is a little hard to manage since it breaks up easily, but I like the texture. You can certainly use soft/regular/firm tofu, and still get the same flavors. Tofu is easier to handle the firmer it is, so I would actually recommend firmer tofu if you're not comfortable with tofu dishes. I've made mapo tofu with the broad bean paste that is pictured above, but this toban djan might be easier to find. Both condiments work great in mapo tofu, so I'd go with whatever is available in the Asian section of your supermarket (or local Asian supermarket). 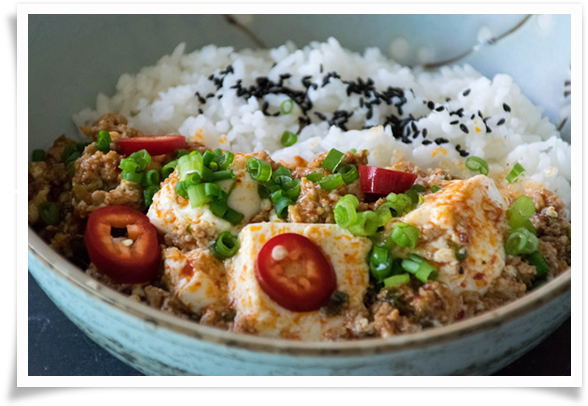 Mapo tofu is delicious over a piping hot bowl of white rice. The dish itself is bursting with bold flavors, spicy, salty, and a little sweet. It will be too much to eat on its own, but with a bowl of rice, it is just perfect. I don't eat such savory dishes often, but mapo tofu is so good that I can easily eat a big bowl of rice with just mapo tofu on the side. You can also have some extra banchan on the side for a complete meal.